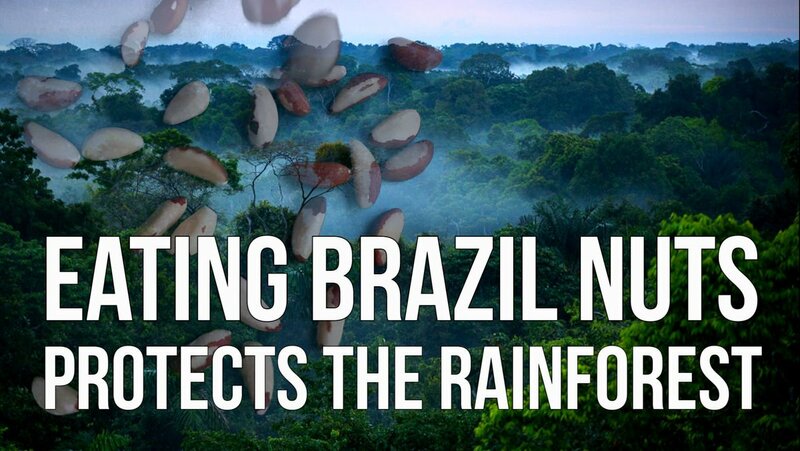 As Brazil nuts only grow in a healthy pristine rainforest by eating them you are promoting the protection of the rainforest in its natural state. Brazil nuts grow in the Amazon rainforest and have not been successfully cultivated. Eating Brazil Nuts Protects the Rainforest. Brazil nuts only thrive in a pristine Amazon rainforest. They grow best in an untouched primary forest, else yields can fall by 70% in a secondary forest environment. Surrounding trees and vegetation are not disturbed or removed by farmers as this affects the quantity and quality of the Brazil nut crop. Keeping the rainforest healthy maintains the bee population who pollinate the flowers. Orchid bees are attracted to the Brazil nut tree as they are strong enough to open the flower and drink its nectar. Attempts to cultivate brazil nuts outside the rainforest have failed. Meaning all Brazils are grown in their natural environment. Buying Brazil nuts employs locals and places a value on preserving the rainforest. Just two animals are known to be able to crack the tough outer shells. Us and the agouti, a native Amazonian small mammal that looks a bit like a guinea pig. Brazil nuts are actually classified botanically as a seed as they grow in a large pod. They are closer in relation to blueberries than walnuts. Brazil nuts are very high in selenium and experts advise to only eat a couple a day, to avoid selenium toxicity. Selenium is healthy but you need just the right amount. Any issues with over-consumption will fade after you stop eating Brazil nuts. If you enjoyed this short video on brazil nuts and the ecological benefits of consuming these then you may be interested in my video on Ethical cashew nuts processing factory.